The volume of emerging technologies can overwhelm the best of us. Yet it’s impacting business and society alike. In recent years, many top Fortune 500 companies have slipped out of contention as their business models failed to keep up in these turbulent times. Survival requires constantly adapting as your customers’ behavior changes. You need new systems, processes, and intentions in place to recognize disruption as it happens, assess new opportunities, and quickly test new ideas. Is your company equipped to change with your customers? Is it ready and able to create meaningful experiences that keep them hooked? If not, it’s time to recognize how customers are not only changing but also how they’re sharing experiences about you and your competition. This is where real transformation begins. What’s the Future of Business? is not a question— it’s an answer. It explains how experience design helps your business and how you can harness its power for business growth. This book introduces a new movement that aligns the tenets of user experience with innovation and leadership to improve business performance, engagement, and relationships for a new generation of consumerism. What’s the Future will also inspire you to rethink your business models, approach, and customer and employee relationships in order to create amazing, real-world experiences. 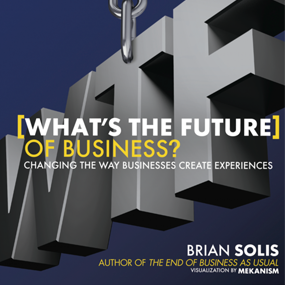 Brian Solis is a digital analyst, anthropologist, and also a futurist. In his work at Altimeter Group, Solis studies the effects of disruptive technology on business and society. He is an avid keynote speaker and award-winning author who is globally recognized as one of the most prominent thought leaders in digital transformation.